An LED is short for a light emitting diode. It is a special diode that when current passes through it it emits light. Too much current will quickly destroy the LED. For that reason a resistor in series is put in the circuit,the value of which is determined by Ohms law. LEDs will work on AC current but it is good practice to run them on DC current. For AC power in we need in series to the LED a bridge rectifier and a resistor. A single diode can be used instead of a full bridge but the method is less efficient. An LED is much more efficient than a light bulb and circuited correctly should never need replacement. Power used by an LED is 1% to 20% of what a comparable light bulb will use. Early LEDs were directional and had an unpleasant bluish cast. More recent ones are much more satisfactory. 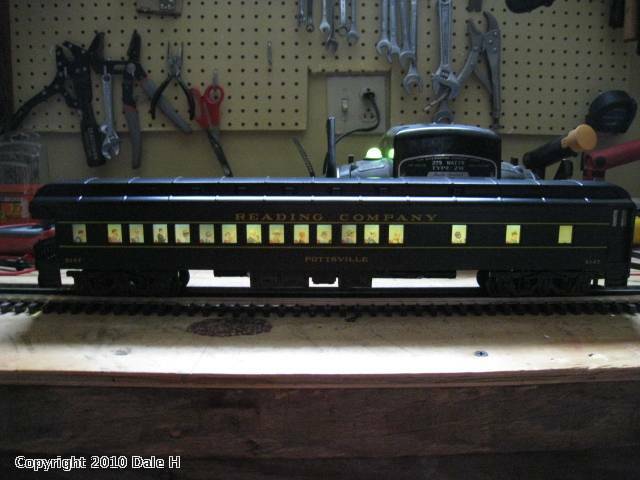 Here is one I use for building and passenger car lighting. It is warm white with a 140 degree view angle. When mounted on a structure roof the spread is similar to a light bulb with a reflector. Shipped from China they cost about 35 cents each for 100 LEDs. A 510 ohm resistor comes with each LED. I mount mine on commonly available electrical fish paper. Cut to desired dimensions. On a passenger car 1 inch by 18 inches for example. The strips can easily be taped together. The LEDs can be gently pushed through the paper and the leads connected by soldering wires to the pins on the flip side. Other components such as a bridge rectifier and resistor can also be mounted. A 25 or 40 watt pencil tipped soldering iron does the trick. Put the tip on a pin for a second,melt in solder and remove. Do not overheat the joint. Here is a simple circuit a bridge rectifier and 2 or more LEDs in series. The resistor is sized for 24 volts,the peak voltage of an 18VAC transformer. Up to 6 in series can be driven by this voltage. A pot can be inserted if adjustable dimming is desired or a larger than minimum resistor can be used. 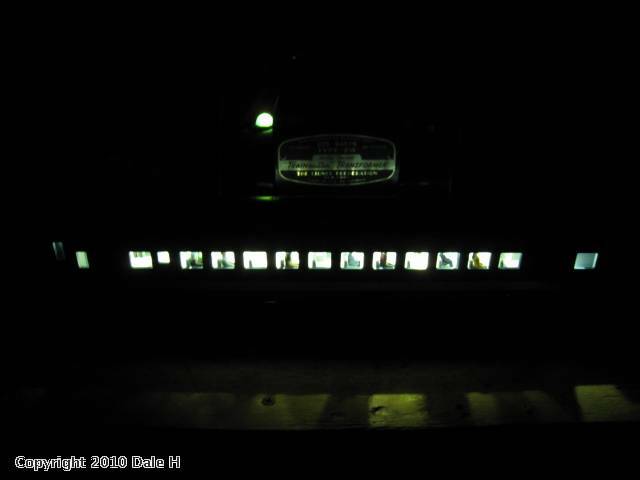 If used in a passenger car the LEDs will dim as do light bulbs. A constant voltage circuit will be discussed later. An added capacitor will smooth pulsed current allowing maximum intensity and in a passenger car reduce flicker from dirty track. If a capacitor is used a 22uh choke should is recommended to eliminate signal interference. I do not use DCS so I have no way to test it. Here are circuits mounted on the fish paper. The fish paper can be glued to the roof with silicone. On metal roofs insulate the back of the paper with another strip of fish paper. The power is connected to the pickup rollers and frame. Later I will post more circuits. My first post here,hope pictures come up. 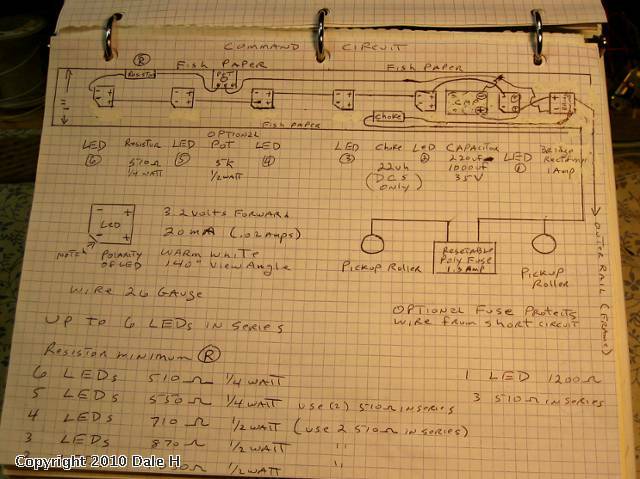 This circuit can also be used for building lighting. The maximum number of LEDs in series is determined by input voltage of the transformer used for the lights..( Input voltage divided by 3.2). Safe for plastic roofs as the string emits virtually no heat. Regardless of the number of LEDs in series the circuit will pull 20 ma (.02 amps) For an 18 volt feed that is about a half watt. These things put out plenty of light. However if more light is desired 100 ma 5 chip LEDs are available. They are wired the same way,series wiring is always more efficient. If using these make sure the resistor has ample wattage. For DYI use Ohms law E=IR. Resistor size is voltage drop divided by the amperage. Example 16 volts in, 4 LEDs in series. 16-12.8=3.2 3.2 divided by .02=160 ohms. Use a 180 ohm resistor (next higher standard value) 3.2 volts X .02 amps = .064 watts so a 1/4 watt resistor is fine. For dimmer LEDs use a larger than minimum resistor. You can also combine resistors to reduce or increase values. 2, 100 ohm resistors in parallel is 50 ohms resistance. 2 ,100 ohm resistors in series is 200 ohms resistance. 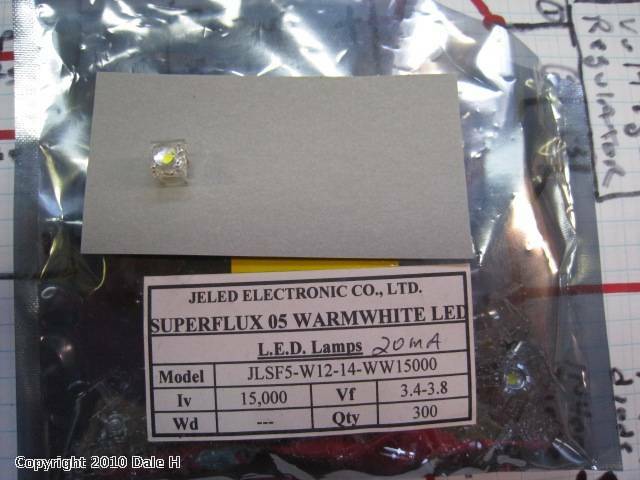 Do you have contact info for JELED Electronics, I would like to order those LED's for passenger car application. Hi JCATs. Here is a link to their Ebay store with the specific LED. They seem to be out of them or they could be discontinued. They have a 100ma version of them,but they may be too bright for passenger cars. This site seems to not allow links so you may have to cut and paste. I will try to contact them to see if they will run them again. What is the last line in your drawing? For 2 LEDs in series 910 ohms half watt is the minimum value to protect the LEDs. You can go higher than that if you want the LEDs to be dimmer as with all the values. There are some better pics in the Caboose lighting thread.